If you’ve got a big dog, you need to put a little more thought into your fence design than if you have a Chihuahua or a Pug. Big dogs can be hard to contain for a number of reasons. Firstly, they’re big, which means they need big fences. Secondly, big dogs are usually more energetic and athletic than smaller breeds of dogs, meaning they want to escape the confinements of their backyard to roam around the greater world. So, here’s how you can keep your oversized pooch contained. You obviously need to build a fence that is bigger than your dog, but you also have to build a fence that is bigger than your dog’s jump. It’s incredible how high dogs can jump when they want to get over something, so build your fence even bigger than your dog’s maximum jump. The best way to judge your dog’s jump is to hold a treat at different heights and test their leap. Dogs aren’t noted for their climbing abilities, but they can use their paws and claws to clamber over things if they want to. You need to choose a material that won’t provide your dog with any footholds, so mesh fences or chain-wire fences are not a good option. The best options are wooden fences, modular fencing or aluminium slat fencing with minimal spacing between slats. Preventing jumping and climbing is one thing, but you also have to protect against your dog’s bite. 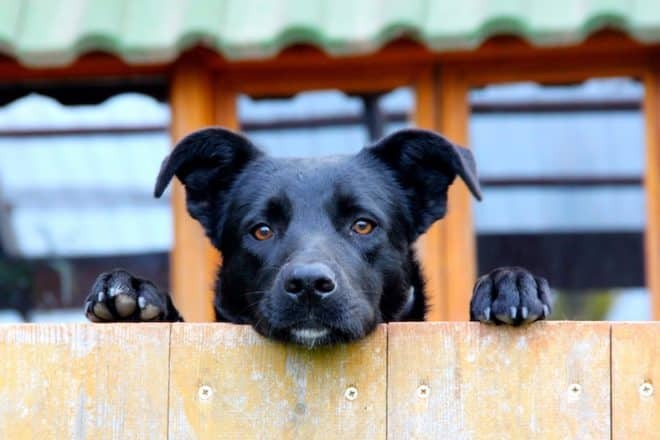 Dogs can chew through fences in a matter of hours, so if your dog loves to chew, go for a sturdy fencing solution, such as aluminium slat fencing or steel. If your dog is a digger, you have to guard against their ability to create an escape tunnel. To do this, you need to ensure the fence goes underground by at least a metre. That way your dog will come up against a roadblock during its escape mission. You want your dog to be able to see a little bit of the outside world, but you have to remember that the outside world is full of stimuli that make your dog want to escape. Whether it’s other dogs, kids riding by on scooters or the tribe of possums that live in the tree outside your home – if your dog can’t see them, it won’t want to chase them. Setting up an invisible electric fence is an easy option, but it doesn’t provide your dog with a nice living environment. You wouldn’t want to be contained in an electrified prison, so don’t do it to your pooch. Invisible fences can even lead to behavioural problems with dogs, so go to the effort of giving them a proper fence. If your dog loves its backyard, chances are it won’t want to escape. So many behavioural problems are caused by boredom, and running away is no different. Make sure your dog has plenty of toys and space, and most importantly, make sure you give your god plenty of attention. Most large breeds need a lot of exercise, and if you aren’t proving them with opportunities for exercise, it is natural that they will grow restless and try to escape. You need to try and wear your dog out every single day, by taking it for a big walk or a run. An exhausted dog is a happy dog, and an exhausted dog won’t feel the need to run away. Follow these tips to provide the perfect enclosure for your beloved pet. The right fence isn’t just a way of keeping your dog locked up; it’s a way to keep it safe. Everlast Services have been providing the people of Melbourne with high-quality and affordable fencing solutions for over 20-years. No matter how big your dog is, how high it can jump or deep it can dig, we’ll be able to come up with a fencing solution that works for you, your dog, your property and your budget.